Great deal especially with £30 off. Batteries and chargers cost £120 at amazon. Mower alone is £190.39 at amazon. I've had a cordless mower (Einhell from Amazon) and a cordless strimmer (from screwfix) for more than 2 years now and it's super quick to cut and trim the lawns ("lawns" sounds grand but 2 small ones separated by a wall and then 2 small ones at the front of the house, much cable mucking aboutary). I paid more than that for just the mower. This price for the pair is an absolute steal, recommended if you can afford. But still a HOT deal!!! …Reposthttps://www.hotukdeals.com/deals/worx-cordless-lawnmower-and-trimmer-twin-pack-16999-argos-2924837But still a HOT deal!!! Assuming the strimmer is similar to the one that was clearance in Homebase last year. While it's good, it's a bit on the heavy side and the batteries don't last long if you've got a lot of strimming to do. So you need to balance whether you really do need a cordless one. It's a good mower, use it on eco setting and works fine. Grass box fills a bit too quick but does have an indicator to let you know when it's full. Strimmer is good but the wire guard is too big. The line doesn't cut as far as the wire guard by about 20mm! So if you are trying to trim upto a fence you are left with 20mm of grass left up against the fence. One thing to watch is you only get 3 year guarantee if you register within 14 days I think. I bought one before price went down :-(It's a good mower, use it on eco …I bought one before price went down :-(It's a good mower, use it on eco setting and works fine. Grass box fills a bit too quick but does have an indicator to let you know when it's full. Strimmer is good but the wire guard is too big. The line doesn't cut as far as the wire guard by about 20mm! So if you are trying to trim upto a fence you are left with 20mm of grass left up against the fence.One thing to watch is you only get 3 year guarantee if you register within 14 days I think. These are great, fine for a medium lawn , don't cut as short as Rotak but it's so simple to run around quickly without worrying about the wires. Strimmer has been way better than a black and decker, wire doesn't seem to break every 5 secs. It does? Mine just seems to clip into 2 holes 1 either side. It does flip up so it's not in the way but I am trying to strim upto a delicate painted fence whose finish will be damaged by a strimmer line. It does? Mine just seems to clip into 2 holes 1 either side. It does flip …It does? Mine just seems to clip into 2 holes 1 either side. It does flip up so it's not in the way but I am trying to strim upto a delicate painted fence whose finish will be damaged by a strimmer line. Damn this site ‌ ,made me order this today. Put off by the battery life on this, my garden isn't exactly a football stadium size but id say 150sqm so if it wouldn't do that on a single charge it's not great...especially if you want to use the trimmer afterwards. Good deal though if willing to accept the battery life. Cheers. There are 2 guards, 1 to stop it throwing stuff back at your feet and the wire one to stop the line hitting flowers. It's the wire one that is about 20mm too far forward of where the line cuts. So you can't get closer than 20mm from plants or fences. I've got the Ryobi 36v and it's garbage, I've gone back to petrol. I can't see how 20v would be anywhere near powerful enough unless you cut your grass weekly. "Mower alone is £190.39 at amazon" Can't find it on Amazon, am I being thick !! I've got the Ryobi 36v and it's garbage, I've gone back to petrol. I can't …I've got the Ryobi 36v and it's garbage, I've gone back to petrol. I can't see how 20v would be anywhere near powerful enough unless you cut your grass weekly. Ah that will help. I'm still not convinced but I guess it's more modern than mine. I just bought one and did a lawn that was already been but last week. Lawn is about 60 sq m . Charger take 3 hours to fully charge. I mowed and trimmed it and just made it before batteries died. So battery is not too good. Did anyone else receive it in a generic brown box? The box had no marketing on it so trying to figure out if Argos sold me a repackaged item. I just bought one and did a lawn that was already been but last week. Lawn …I just bought one and did a lawn that was already been but last week. Lawn is about 60 sq m . Charger take 3 hours to fully charge. I mowed and trimmed it and just made it before batteries died. So battery is not too good. Did anyone else receive it in a generic brown box? The box had no marketing on it so trying to figure out if Argos sold me a repackaged item. Me and my mate both got one from Argos on Friday and it came in brown box with both inside. Must just be the way it is packaged as a bundle. That three hours is poor, the single batteries charge in about 45 - 60 minutes on my drill, would be better with two separate chargers than that dual port supplied with it. 2hrs for dual charger charging both batteries. Einhell 36V 33cm Li-Ion Cordless is same price at Toolstation with free trimmer could even be same machine? 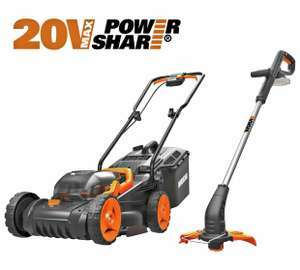 just brought this works well yes i have small garden.lowest setting is too low had to move up one nice cut .if you have other worx products its a no brainer ...2x 20v batteries £39.88 each .trimmer £30.88 that means paying £59.35 for the mower. price for batteries and trimmer from amazon..forgot cost of charger £39.99 makes mower £19.36. Used this for the first time tonight it is brilliant. I used the lowest setting as wanted a short cut on the grass. Did the front and back and used the strimmer and still had two bars battery left. I had it on eco mode as well and it cut brilliantly. Very happy and would recommend this. Cordless is the way forward so much quicker! Makes mowing the grass a pleasure not a chore! Just got this deal. Looks great for the price. Batteries currently charging. Can confirm they come in brown box, normal. Can anyone confirm what model number you got? Mine is the wg779e.2. That is different from the one on the link. Does yours make this noise? Trying to decide whether it’s normal or not. Does yours sound like this?